Last Thursday, Google shifted the pack display (Blended Results) from mostly blended with large pins to the smaller pin display (Map Packs) with locally driven ranking (ie Maps order) rather than organic driven ranking. Last night they switched (thanks to Nicolai Helling) the display of the pack back to a larger pinned display. 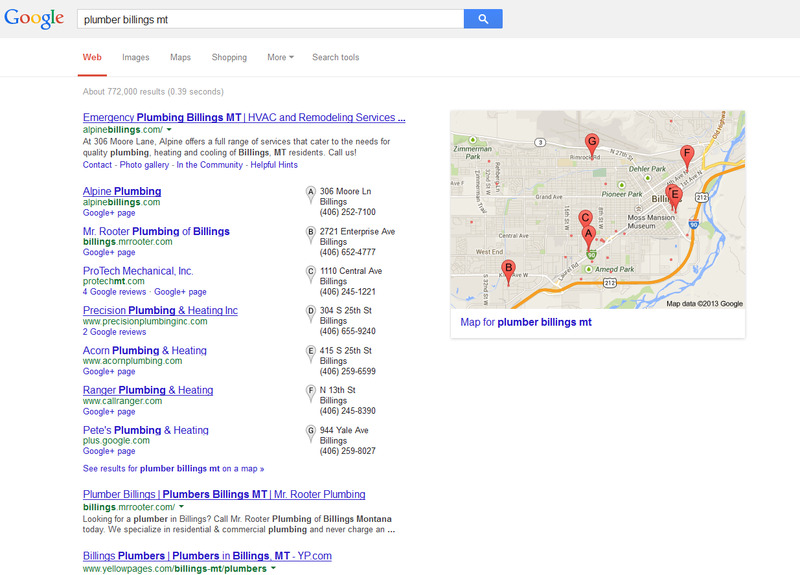 So far at least, Google has retained the local, map based rankings rather than driving the results order from organic rank (Blended Map Insertions). The switch last week and the switch last night were apparently world wide. Because the blend is not occurring, home (authority) pages are still able to show as a separate organic result in the SERPS and not be merged into the local result. Because the current results are not blending you are also NOT seeing author tag or title tags integrated into the local result. This type of display (Blended Map Insertions), looking like blended results but being primarily based on Maps order, have been ever present over the past two years constituting roughly 24% of pinned results. They were seen mostly in the restaurant searches and to some extent in the locksmith searches. Today at least they are displaying at 100%. The positioning of the pack under blended results typically started anywhere in the first four results. With the current state of the local display most of the pack results are inserted at postition four. In a small sample of ten searches, eight started at position 4, one search started at position 2 and one started at position 6. I assume that a larger search sample would show a similarly broad distribution with the bulk of pinned results starting at position 4. Are Blended Results going away? If you had asked me yesterday I would have said yes. Today, I am not sure so of anything other than that we are in the midst of both display and ranking shakeups and where it will settle is anyone’s guess. Its hard to know exactly what is going on and even more so why. This change which started last Thursday seems to be continuing. Thx for mentioning my post. Did you realize that less competitive queries und local brand queries look like this too? Just noticed this so I checked Lindas forum to see if anyone had posted on it, and of course good ol’ Professor Maps was on top of it! this has been a whirlwind of a week. Blame David Mihm. When we did our research earlier this year it became clear that a fairly large percentage of search results looked blended but weren’t… so we wanted to distinguish them. Now that’s interesting. Those brand queries have ALWAYS returned the smaller Map Packs. We’ve been discussing since Friday. The 40 post long thread is in the G+ L IMPORTANT section. I explained there, early on, after Colan and Joy discovered the font size change, that due to all the doubles and the link above the pack Google had reverted back to the old Places algo and display. But Mike it seems like you are saying something just changed today? I’m not seeing it. For the past several days it’s been the old Places packs. Can you explain what’s changed today from 2 days ago? I just checked a bunch of listings and they all still look the same. Can you explain the distinction between yesterday and today so I can try to follow the shift? Maybe I’m sitting on a different data center? The display has changed from the Map Pack style display to the Blended style of display with the larger pins. Also the “near” line has been removed. Thanks, Mike I just noticed the “near” link is gone too. Just noticed an odd ranking change I’m trying to figure out. Posting at my place now with screenshot if I have a before I can use for comparison. But it looks like the blended is back. At least in this one obvious example I’m looking at. Competitive market. A is now a listing that has NEVER been in the pack. Was always just page 1 organic. Its UNclaimed, far from industry centroid. Just popped to A out of nowhere, due to pure organic strength. I think the Places algo/display we’ve been seeing past few days was rolled back and we are back to blended – BUT there are still doubles, so it’s not exactly like the previous blended. Good catch Eric. Same for me. Do you still have local carousels in the US? Mike, an extension of Nico’s question: Do you think Google will completely shift to the carousel design for all categories of local listings? Now they are predominantly for restaurants, hotels and some recreation-type local businesses. Do you (members of this thread included) see the extension of the carousel format to accountants, plumbers, car washes etc? I have heard (I can’t remember the source) that Google was looking to expand the carousel. Like any industry or geography covered by local, there is varying amounts of content in the listings. To make the Carousel work there needs to be a broad availability of photos and reviews in the particular market segment otherwise the Carousels look dumb. You want to know something really weird? When I typed ama, getting ready to go to Amazon on Chrome, AutoComplete returned some results from Google+ circles. Haven’t been able to duplicate it again.